Berlin – a melting pot of cultures. This episode is about Sweden & USA. Mikael Stavoestrand is recognized as a minimal structural engineer for quiet some time – in both ways, as a solo artist and in various collaborations. 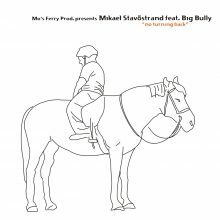 On „no turning back“ his co-worker for the vocal component is once again Big Bully with a softly pushing voice right above Mikael’s bouncy, but clean beats. On B1 the title track is remixed by Krause Duo. In contrast to the original they replaced most of the vocals by an e-piano line with warm and dub-like harmonies. In the end B2 arises the question: „Where did you go?“: The answer is … maybe like every monday: dancing!